Wales prop Tomas Francis says the England pack will hold few fears if he is picked to start on Saturday. With first-choice tight-head Samson Lee struggling with a calf injury, Francis could be set to win his fourth cap in the crunch Pool A game at Twickenham. But the Exeter Chiefs player, 23, has regularly faced the England front-row at club level in the Aviva Premiership. "I have played against all of them pretty much, and I know what they can bring," Francis said. "We have got plenty to match them and even take them on I think. "I relish it, really. We know what's coming, and we are looking forward to it,"
"England at Twickenham in their World Cup, it doesn't get much bigger than that... we don't need to get any motivation for it - everyone is up for it. "We don't fear them at all. As a Welsh team we don't care where we play - home or away. Our record shows we enjoy it. 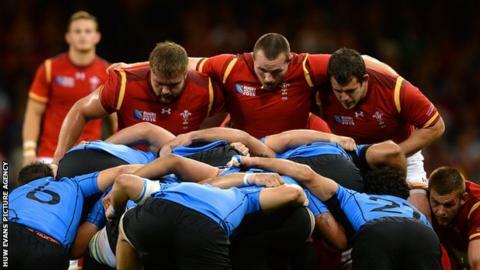 Props Lee, Paul James and Aaron Jarvis all suffered injuries in Wales' opening 54-9 win over Uruguay at the Millennium Stadium on Sunday. Wales also lost Cory Allen for the World Cup, with Tyler Morgan having replaced the centre in the squad, while scrum-half Rhys Webb, full-back Leigh Halfpenny and centre Jonathan Davies were all ruled out before the tournament began. Liam Williams also picked up a thigh problem in the Uruguay game, but the Scarlets full-back is expected to be fit to face England. England have their own injury concern, with outside centre Jonathan Joseph picking up a chest injury in the hosts' 35-11 win over Fiji on Friday, while number eight Ben Morgan has a minor knee knock. But York-born Francis, 23, whose grandmother Eirlys is from the Swansea valley, says it will be the forwards who determine the outcome of a game that will see the losers in real danger of being knocked out at the pool stage. "They will want to take us on physically, if their pack gets dominance they will back themselves," Francis said. "If we can match them and give our backs a platform, I would fancy our backs to knock them over. "We cannot read too much into that [England's opening win against Fiji]. There was a lot of emotion in that game for them - it would have been one of the biggest occasions for their guys. "It was the same for us [against Uruguay in Cardiff]. It is a game you need to come through. These sides are going to go for it, but we have both come through with wins and five points. "We have to stop their pack. In the Six Nations, they played off their pack to get that dominance. If we can pressure their nine and 10 and get them nervy, it will be important. It's a big game."